As if singing from the same hymn sheet as Steven Moffat's strategy for getting into a Christmas Special-ly sort of mindset, Dan Abnett cribs from Christmas songs for his chapter titles, as well as scattering a few lyrics through his prose. 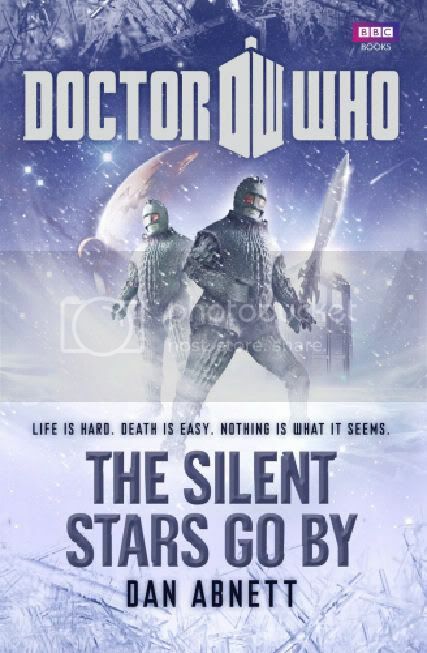 And this novel can pretty much be thought of as “the other Christmas Special 2011” given that it's about Ice Warriors attacking an Earth colony at their equivalent of Christmas time, while unusually vast amounts of snow are getting in the way of normal life. Abnett could hardly have made this any more Christmassy – there's a lovely coda showing the value of a thoughtful Christmas gift, a truly jaw-dropping seasonal pun at the conclusion of Chapter 1, and the winter wonderland setting is traditionally appropriate. No doubt many a fan will be finding this in their stocking or under the tree come December 25th – and if you wind up being one of those people, you'll be in for a treat. In some ways this feels like a reaction to last year's The Coming of the Terraphiles, which to my mind read very strongly as a Michael Moorcock literary jape, but rather less strongly as a Doctor Who novel. 'Terra-' is an important prefix again this year, but followed by -form rather than -phile this time around. BBC Books have commissioned something that feels very much like a trad Doctor Who adventure. By and large the main characters' voices are captured well (even if the running banter about things being a bit “-ish” or a bit “-esque” wears slightly thin on occasion), and by page 41 the Doctor and Amy have already been separated from Rory, and a prison cell has loomed into the proceedings. If Christmas is all about rituals, then so too is Who. Dan Abnett also structures a few clever references to his story's title into events, so we find “snow falling as silently as moving stars” (p.83), and Ice Warrior's “scales [that] twinkled like stars as they showered into the air” (p.271). And the name that some Ice Warriors have for the Doctor – Belot'ssar – also becomes beautifully, poetically relevant at a certain point in the tale. It's these thoughtful details, glinting like winter sun on fresh snow, which make the book such a pleasure to savour, consistently revealing Abnett's mastery of his craft. Likewise, his witness accounts of Ice Warrior physiognomy are great. With my apologies to all, I'll admit I never found on-screen Ice Warriors to be the most convincing of alien races, but they are thoroughly plausible here: all red eyes, visors, and menacing green bulks glimpsed through the snow. Oh, and as well as presenting a solid, hefty rendering of the Martian invaders, Abnett's closing sentence is just plain lovely. The point of this story isn't finding out what the “silent stars” are; science fiction 101 makes this as predictable as the changing of the seasons. Instead, perhaps the point is how elegant and brilliant and world-esque or world-ish mere words on the page can be. Building worlds doesn't always take DNA pools and gene codes and sublime cathedrals of engineering; terraforming is what storytellers do all the time with a well chosen description and a telling image. And on the strength of this showing, Dan Abnett is quite simply a great terraformer. If you haven't pre-ordered already then put this on your list for Santa; it'll make perfect midwinter reading. The only downside to such a Christmassy “Ice Men” story? Well, it probably makes a TV Christmas Special covering this sort of ground rather less likely. But as a gift to fans who have long clamoured for just such a tale, this is a book of delights. Purchase from our Amazon store.